When Blossom was 10 she gathered what scraps of felt she could find in her little craft cupboard and made a nativity scene to hang beside the Christmas tree. 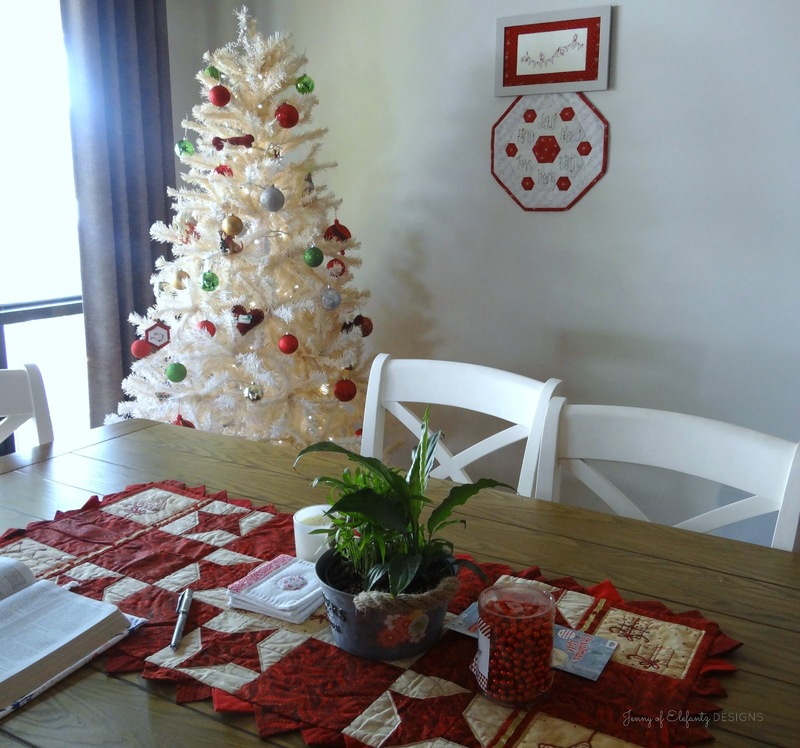 Neither of us were stitchers at that time, so each December I would cook and she would decorate with whatever she could find. 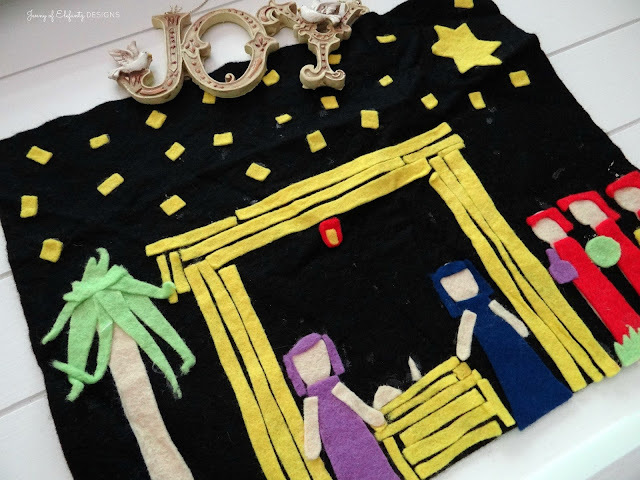 I treasure this Nativity Scene from her childhood, and even though Mr E and I have been shopping for a porcelain one recently, nothing has compared to the simple felt scene our daughter made all those years ago. Since her mid-teens Blossom has been embarrassed when I bring it out each year, a natural reaction for most children as they grow up and their parents insist on displaying those junior works of art, but I don't let her protests stop me. Blossom's second baby is due March 1st, but she's had a scare this week when the baby's head dropped overnight and severe lower back pains began. Assessment by her midwives confirmed the baby was now very low, head almost engaged, much earlier than it should be. She also discovered her health had taken a downward turn and blood transfusions were needed, one on Thursday and another scheduled for next week. I sounded the alarm in our Gentle Domesticity group and an army of prayer warriors took up the call and held Blossom and her baby in prayer for three days. Bless their hearts! What could have been a very early delivery has slowed right down, and though she must take things very easy from now on and let that little cherub in her womb keep growing strong for a safe and healthy birth, Blossom is calm and giving all her extra attention to one on one time with Cully May (who is the happiest little munchkin ever!). I've spent a lot of time with my daughter and granddaughter this week, assisting where I can, praying and just being available if she had need of me, and it made me incredibly proud to watch my daughter conduct herself with such grace and kindness towards all her health professionals even though she was frightened of what may happen with her baby if labour began. Today we have stayed in our various abodes and texted funny things back and forth - she entertaining Cully May and keeping her feet up, and me nursing a rather ghastly migraine but having Mr E beside me as physician. How very blessed we are to have each other, to be a family, to live nearby and be able to step in to help out in times of duress. I think this Christmas what's sitting solid in my heart is gratitude. Gratitude for God in giving us His Son. Gratitude to God for giving me this daughter, my youngest, the child I almost lost my life giving birth to yet who every day 'gives' more to me in love, respect, honour and friendship than I could ever have imagined when I held that tiny bundle in my arms almost 24 years ago. I have gratitude for the Word of God which every day speaks into my heart and gives me understanding, correction, hope and direction. And I am grateful for Christmas, for the quietness and gentleness of this particular Christmas, for even though it's been a week fraught with concerns and hospital visits and a few fears, there has been this underlying sense of God's hand holding us all, securely, lovingly, peacefully. Mr E put the tree up and I gathered some simple decorations and made merry because my heart was overflowing with LOVE for Jesus, for my family, and for those whom God may bring across my path one day and will want to hear why I love Him so much. Simple decorations...celebrating a simple but miraculous birth over 2000 years ago. A birth which changed my life and made it a testimony to love which no author could have dreamed to write. May the LOVE of Jesus fill your heart this Christmas in ways it never has before. May His birth and the miracle of it fill your thoughts with wonder and awe. May you find HIM at the centre of every conversation, every laugh, every tear, every dream, and know that it will all be okay even if things don't turn out the way you hoped because He loves you and He cares about your whole life, from the big issues to the little ones and everything in between. Best and holy wishes to you and yours this blessed time of year. I pray that 2018 shows you a lot of kindness and happiness. It is such a blessing to us all to know that, no matter the storms going on around us, God is in control and His will WILL be done, for our ultimate benefit. I am so very glad that Blossom is doing well, Cully Mae is enjoying her last alone-time with her mom, that Mr. E is there to care for you...now I'll be praying that God will touch you with His healing touch and banish your migraines! May you enjoy the blessings of Christmas, now and throughout the new year! Best wishes Jenny, I look forward to your posts next year. Fingers crosses for your daughter. Oh, Jenny! Please, tell Blossom to be proud of the Nativity Scene she made because it is beautiful! I love it! Merry CHRISTMAS to you Jenny and your gorgeous family. I will remember Blossom and her unborn baby in my prayers and hopefully GOD willing she can hold on to full term. Her nativity scene from childhood is so precious! My prayers have been lifted up on behalf of you and your family. Merry Christmas! I'm so glad Blossom is doing better. I will pray for her and her unborn baby. A loving family truly is a wonderful blessing. Like you, I am thankful to have that kind of family. When life is hard, I've noticed that it can bring us closer to God, and Jesus becomes more and more real in our lives (and yes, that gives us peace). So happy to hear Blossom is doing better. I will continue to pray for her and her baby. I hope you, Mr. E. And your whole family find love and joy this blessed season. Merry Christmas. Jenny, big hugs to you as it has been quite a week for you. I will keep Blossom and the bub in my prayers and I know the baby will come at the right time. I always have a giggle at seeing everyone rushing around at this time of the year and wonder how many really know what Christmas is all about. 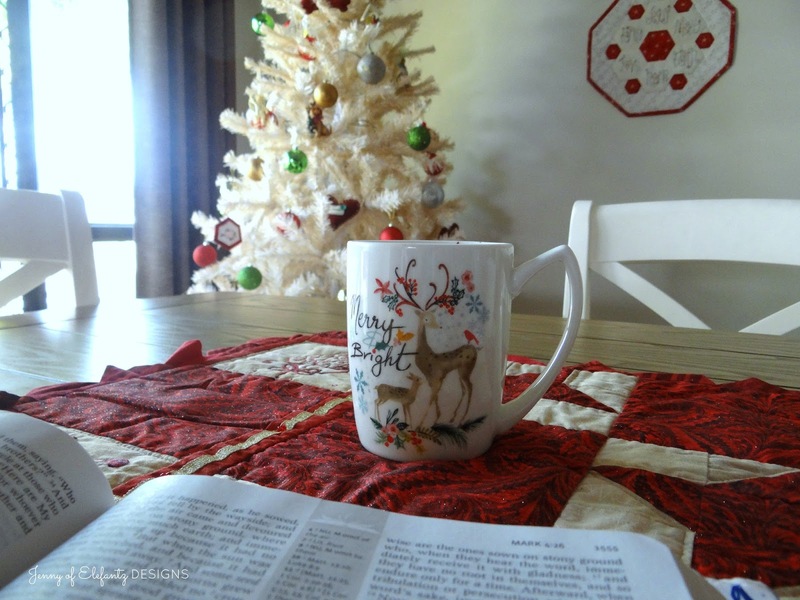 Thank you so much for your inspiring post and I hope and pray that you and your family have a peace filled Christmas. 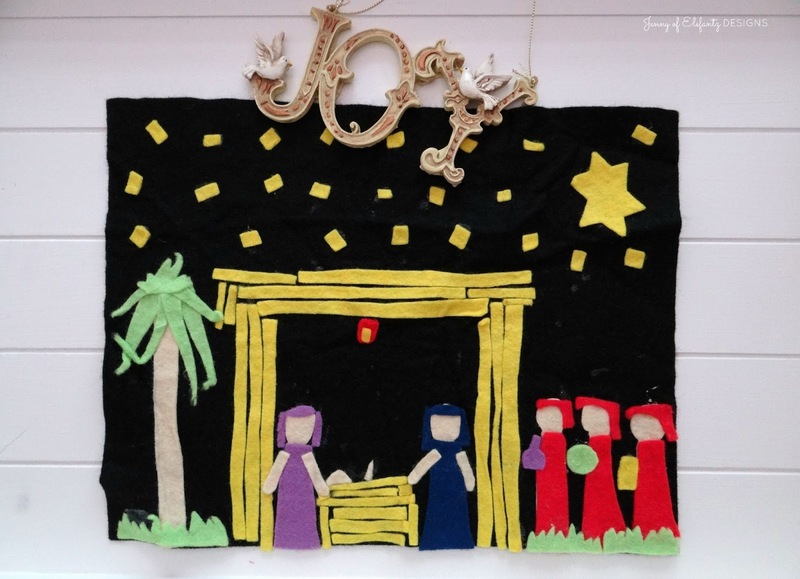 I love the nativity scene that Blossom made and certainly understand the sentimental value of it. Such treasures can never be outshone by any amount if baubles and bling. A beautiful Nativity Jenny! Blessing to you and all the family especially dear Blossom. I will catch up in the New Year. Praying for your migraine. Many happy Christmas wishes from Italy! Merry Merry Christmas to you all! Praying for Blossom and that little precious baby! Things made by the hands of our precious little ones mean so much! I have a wreath of hands made by my youngest son that is so special to me. I am in your Gentle group on Facebook (April Ann) and have lifted Blossom in prayer. It brought tears to my eyes when you were posting this because at the same time I was spending several days with my daughter-in-law who miscarried her 4th child. The baby passed at 6 weeks. They have had a wonderful attitude about it even though many tears were shed. They know that this little lamb now is with Jesus. I will continue to pray for Blossom and her family. God Bless Jenny and Merry Christmas! Phew! That was crazy! I will be praying for Blossom and her baby, too. I love the nativity scene... what a treasure. Have a Merry Christmas! thank you once again Jennifer for a lovely Christian post. Your strong faith in Jesus is such an encouragement to all who read your blog, and possibly the starting point to a life of faith in Him for someone. I love Blossoms nativity. Our tree is full of memory pieces gathered over the years. I will be praying for Blossom and her baby as the weeks go by. What a fright that must have been. I hope you are well recovered from your migraine. Take care of each other. I wish you a Happy New Year 2018. God Bless You. Thanks for reminding me that it is always good to trust God and thus be at peace. Merry Christmas and many blessings in the new year.